Lebo Shale members of the Fort Union Formation, which formed about 65 million to 56 million years ago (Paleocene time). The Fort Union Formation, a heterogeneous geological unit of sandstone, shale, and coal deposits, is overlain by the Wasatch Formation in many locations. These formations outcrop extensively around the east-central margin of the Powder River Basin near Gillette, Wyoming, and around the west central margin of the basin near Sheridan, Wyoming. Open-pit and strip-mining commercial coal operations are common in the outcrop areas. Thickness of individual coalbeds in the Fort Union Formation ranges from a few inches to over 200 feet, with an average thickness of 25 feet. The Fort Union Formation originally was deposited on the margins of an ancient interior seaway as part of river (freshwater, fluvial) systems with braided, meandering, and dissected streams in the center of the basin and alluvial plains along the basin margins (USGS, 1999; Copeland and Ewald, 2008). The irregular spatial and vertical distributions of coalbeds (laterally and vertically discontinuous) reflect shifts of these fluvial and alluvial systems through time. The Tongue River Member of the Forth Union Formation contains thick, laterally extensive coalbeds that vary unpredictably in thickness and geometry, terminating and merging abruptly. The Tongue River Member, including the Wyodak coal zone4 and the Canyon and Anderson coals within this zone, contains most of the recoverable CBM in the Wyoming portion of the Powder River Basin (Figure 2.4b; Copeland and Ewald, 2008). In the eastern part of the basin, regional groundwater flow moves from the south and east toward the northwest and into the central part of the basin (Daddow, 1986; Martin et al., 1988). In the southeastern part of the basin, regional groundwater flow is to the north, although local flow often varies from this overall pattern (BLM, 2003; USGS, 2005). The generally northward regional groundwater flow in the basin moves slowly because of pinching out of sandstone units, which are the principal water-conducting deposits contributing to groundwater flow. Water in sandstone aquifers associated with the coalbeds can be hydraulically confined, particularly in deeper, isolated beds far from recharge areas. Individual coalbeds in the Wasatch, Fort Union, and Lance formations (e.g., the Anderson coal) can also constitute important aquifers. 4A "coal zone," according to Copeland and Ewald (2008), is a stratigraphic interval containing a suite of coalbeds that vary in thickness, have stratigraphic proximity to one another, and split apart or merge from a single coalbed. coalbeds then act as independent isolated aquifers. Flow into or out of the coalbeds along fault and fracture lines takes place to a limited extent (Frost et al., 2010). Because the origin of the coals in the Wyodak and Wyodak Rider coal zone was in a freshwater setting, as opposed to a marine setting—which was the case for the coal deposits of the San Juan, Raton, Uinta, and Piceance basins—the connate waters associated with the Powder River coals were probably fresher from the outset compared to the connate coalbed waters in the other basins. In cases where the Powder River Basin coals are also connected hydraulically to natural recharge areas, the higher relative permeability of the coals would facilitate flow and contribute further to water chemistry in the coals having relatively few dissolved solids compared to water in coalbeds of other western CBM basins (see section on "Geochemical Foundations" later in this chapter). As a result of some combination of these natural circumstances, relatively fresh connate water and/or higher relative permeability, produced water from the Powder River Basin coalbeds is generally less saline than waters produced from other western CBM basins. The low TDS content and low salinity allow management of the CBM produced water either through direct discharge to ephemeral and perennial streams (either with or without treatment) or storage in surface impoundments (see later in chapter for water chemistry and Chapter 4 for details of water management practices in the basin). The degree to which water in the coals of the Wyodak and Wyodak Rider coal zones represents original ("old" or "fossil") connate water and/or younger water that percolated into the coal from surface recharge areas is not well constrained with geologic, geophysical, geochemical, or hydrologic data. The San Juan Basin covers about 7,500 square miles in the Four Corners region of the adjoining states Utah, Colorado, Arizona, and New Mexico (Figure 2.5). The basin strikes west-northwest to east-southeast and is asymmetrical in shape, with the deepest and thickest sedimentary rocks located in the north-central portion of the basin. The major coal-bearing and methane-producing unit is the Cretaceous Fruitland Formation, underlain by the Pictured Cliffs Sandstone. The layered and discontinuous Fruitland coals have three-dimensional complexity, reflecting the original complexity of the back-barrier lagoonal wetland ecosystems from which they originated (Snyder et al., 2003; Riese et al., 2005). 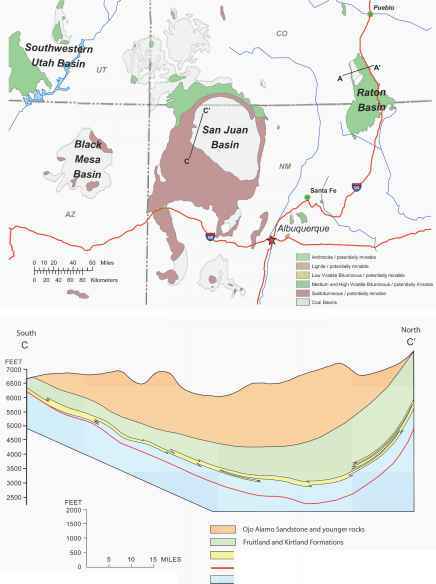 FIGURE 2.5 (a) The San Juan Basin of northeastern New Mexico and southwestern Colorado. The green, purple-brown, and gray shading indicates coal of bituminous through subbituminous grade. Location of cross-section C-C' in Figure 2.5b is identified. (b) A south-north cross section through the San Juan Basin shows the asymmetry of the basin and its major coal-bearing and methane-producing rock unit, the Fruit-land Formation, underlain by the Pictured Cliffs Sandstone and overlain by the Ojo Alamo Sandstone. Although oil and gas production began in the San Juan Basin in the 1920s, CBM development did not flourish until the mid-1980s. By the end of 2008, more than 7,000 CBM wells were active, extracting methane from coal deposits primarily within the Fruitland Formation at depths up to 4,000 feet below the surface. SOURCES: (a) ALL Consulting (2003); (b) Adapted from Fassett (2008). sc hydraulic head in two of these zones is considered "high" (with respect to the hydrostatic water column), the reservoir water volumes are relatively low (with respect to the Powder River Basin), while the gas volumes remain relatively high (EPA, 2004; see also Table 2.1). Given this condition and the relatively high salt content of the produced water (refer to section on "Geochemical Foundations" later in this chapter), CBM producers in the San Juan Basin put a large majority of produced water from the coalbeds into temporary storage in above-ground storage tanks for later reinjection into formations below the coal. FIGURE 2.6 West-to-east cross section (see location A-A' in Figure 2.5a) through the Raton Basin shows an asymmetry similar to the San Juan Basin. 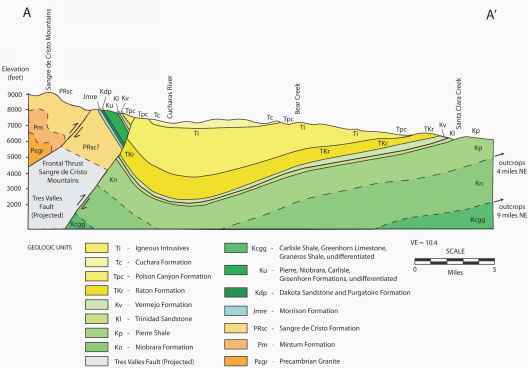 The primary coal-bearing and CBM-producing units are the Vermejo and Raton formations. Depth to the methane-bearing Vermejo Formation coal zone is about 2,400 feet (Johnson and Finn, 2001). 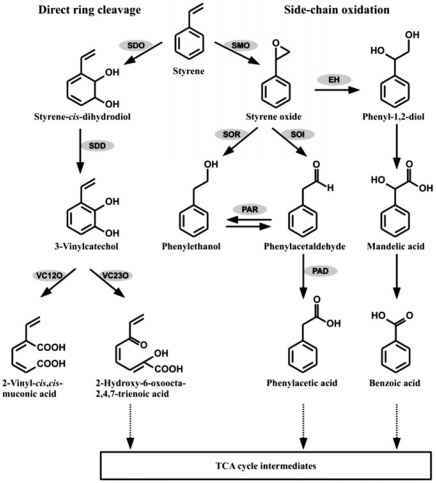 SOURCE: Adapted from Stevens et al. (1992). Reproduced by permission of the Gas Technology Institute.